Work on the much talked about, and long-delayed, bike/pedestrian underpass in Northampton finally got underway when the contractor, Northern Construction Service of Palmer, mobilized its forces and equipment at the site last week. 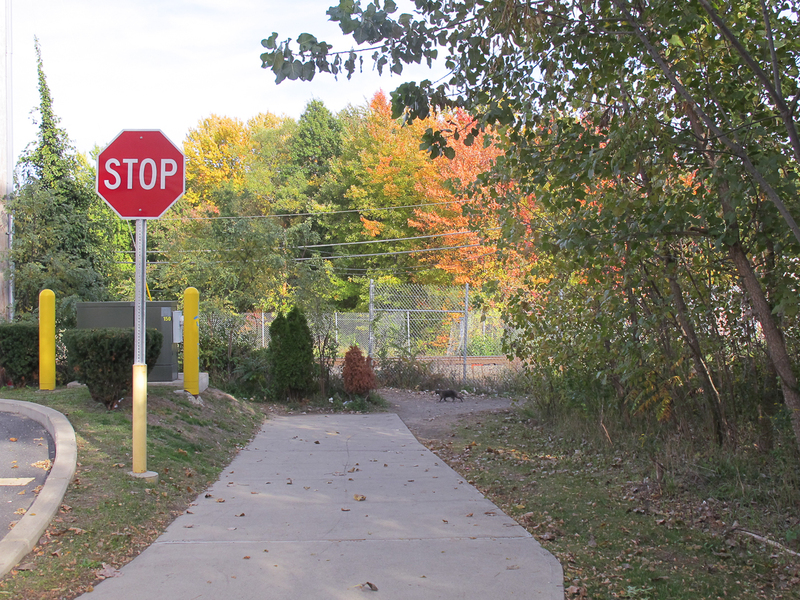 On the south of the Walgreens property on King Street there is a concrete path (shown above) that runs perpendicular to railroad tracks. This path — which at the moment dead-ends at the edge of the property — was designed as a bike path back in 2007 when the Walgreens was built. The original plan (shown below) even called for the installation of a “bike path ends” sign near the tracks, since it was apparently clear even then that it would be some time before the railroad underpass was built. Note that all of the existing bike paths in the area of the underpass, including the Walgreens path, will be connected once the underpass project is complete in 2017. 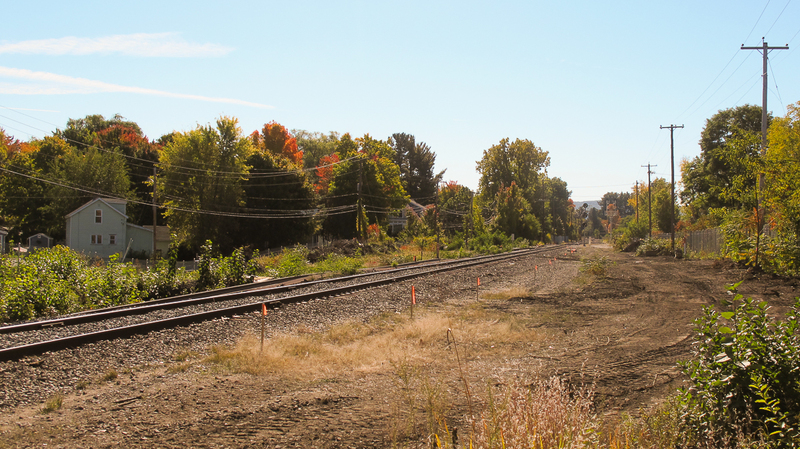 Here we have a view of the site where the long-delayed underpass will finally be built. 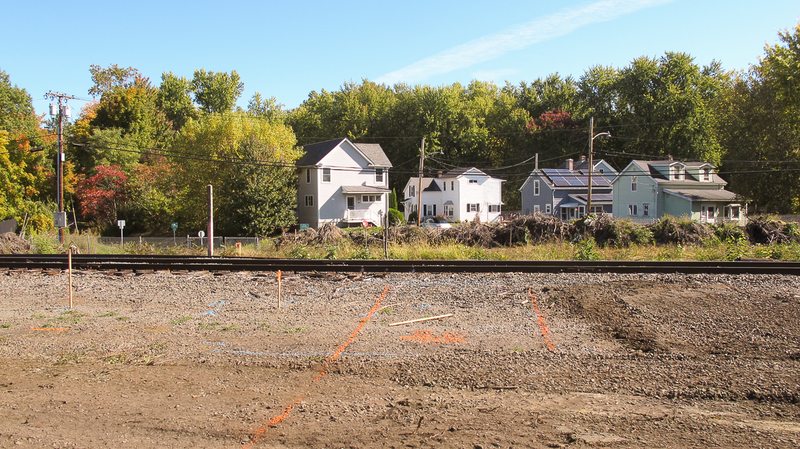 Note the markers that have been placed in the ground by surveyors working on the project. This image shows markings on the ground (in orange) that would appear to indicate the location of where the actual underpass will be sited. 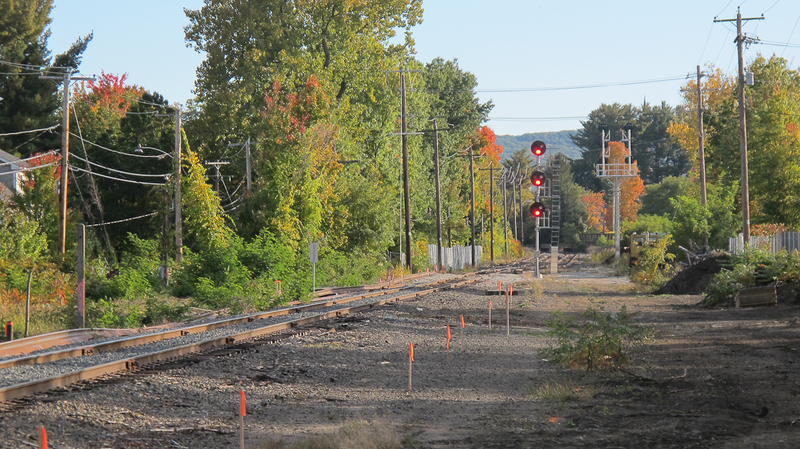 Shortly before 4 p.m. on Saturday afternoon a set of triangular color light signals along the rail line lite up. The signal indication gives the hint that the northbound Vermonter was approaching Northampton. The next signal was the sound of two short blasts from the engine’s horn as the train pulled out of the station. 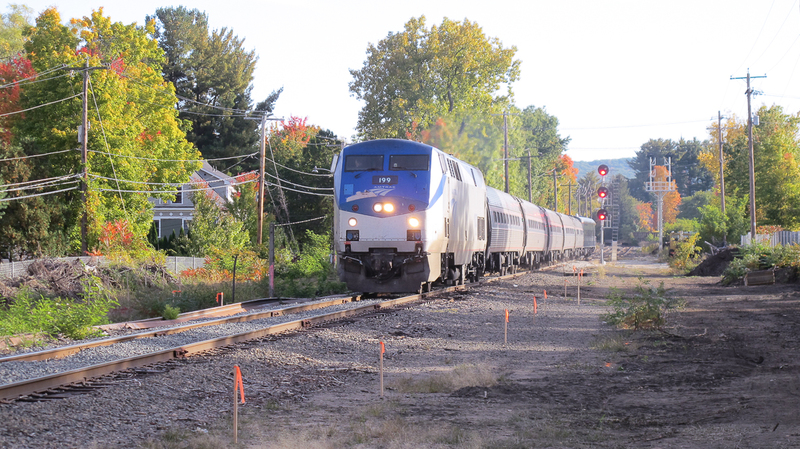 At about 4:05 p.m. Amtrak’s Vermonter came around the curve to the south and posed for this nice image. Actually, the train was traveling at its maximum authorized speed of 30 m.p.h. — for this section of track — when it passed the work site. Part of the reason the speed is limited to 30 m.p.h. here is because the jointed rail on this stretch of track has not yet been replaced with newer rail. The jointed rail at this location will be replaced with new continuous welded rail (which can be seen laying in the weeds in this image) once the underpass is constructed. On the rear of the train was a surprise guest — a private rail car. This car — known as the Yerba Buena — is owned and operated by the firm Rail Ventures. 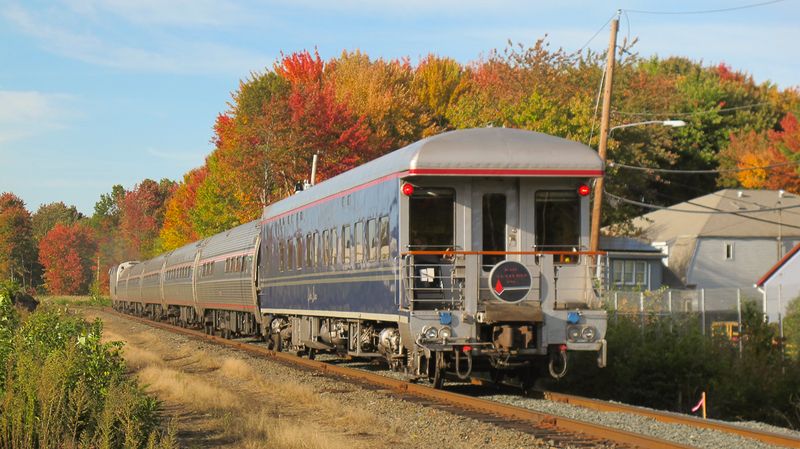 It is one of about 200 private rail cars in operation in the U.S., many of which are available for private excursions.